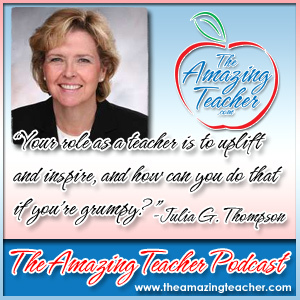 This week my guest on the Amazing Teacher Podcast is Julia Thompson from JuliaGThompson.com. Julia is not only a classroom teacher, but she is a best-selling author. Her book, The First-Year Teacher’s Survival Guide , offers practical strategies for new teachers to not only survive those first few years, but to thrive. I found Julia sharing her wisdom on Twitter, and felt that she would be the perfect guest for the podcast. 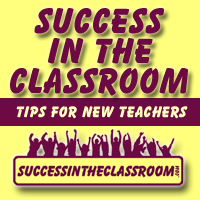 In the interview, Julia shares her thoughts on classroom management, connecting with students, and how to have a lasting impact on kids. Julia offers some amazing tips on her blog. Among them is her post: Fifty Reasonable Options You Have When Students Misbehave. Julia elaborated a little on a couple of these options – #11: Make students feel worthy of trust, and #28: Be emotionally accessible to your students. Grouchy teachers have more problems than positive ones. I asked her if it would be OK to create a downloadable PDF version of the 50 Options for the listeners, and she was so gracious to agree. Below, there is a link where you can download this great resource. Please download it, and share it with your colleagues. I had a great time speaking with Julia. She is an amazing teacher, and I know you will find great value in what she shares. Thank you for spreading the word about The Amazing Teacher Podcast!